Manila is ablaze with dessert shops this time of the year, and the time couldn’t have been more opportune than this season of El Niño. 8 Missouri’s Carousel Creamery is one of those dessert shops that will try to beat the Manila heat with – wait for it – 101 flavors of ice cream. The enigmatic number was said to have originated from the ice cream parlor’s late grandmother who had a strong love for Chicharon and ice cream. The gesture is ultimately touching and created such a unique twist to our ordinary ice cream, that surely drew an influx of customers right into 8 Missouri. I was overwhelmed with the flavors, ranging from a Yoda-like Oreo flavor Yoreoda to Java the Hott, which seemed to reflect the creator’s love for the Star Wars Saga. Talk about the ultimate consumer paralysis. The Beer and Chicharon, Maple and Bacon, and Olive and Basil flavors were all extremely intriguing, but it was the tried and tested NY Cheesecake that drew me to my choice. S’mores and Bailey’s was a tough decision to make, my love for anything ice cream mixed with liquor will surely perk my interest. After 10 minutes of contemplating, Strawberry Balsamiq won my vote, the flavor reminiscent of New York’s Bi-Rite Creamery chain where I first encountered this flavor. Not entirely original, you see. The result is a fun mix of flavor, the right balance of sweetness and creaminess coming from an ice cream house whose expertise is toying around weird flavors. The price points are reasonable, making Carousel Creamery a good excuse to have dessert. Nevertheless, the crowd’s excitement will make you enjoy the place, and the service is remarkable for to-go ice cream. You first order how many scoops you want, and you’ll be given a mini ice cream token for claiming your ice cream in the carousel line. 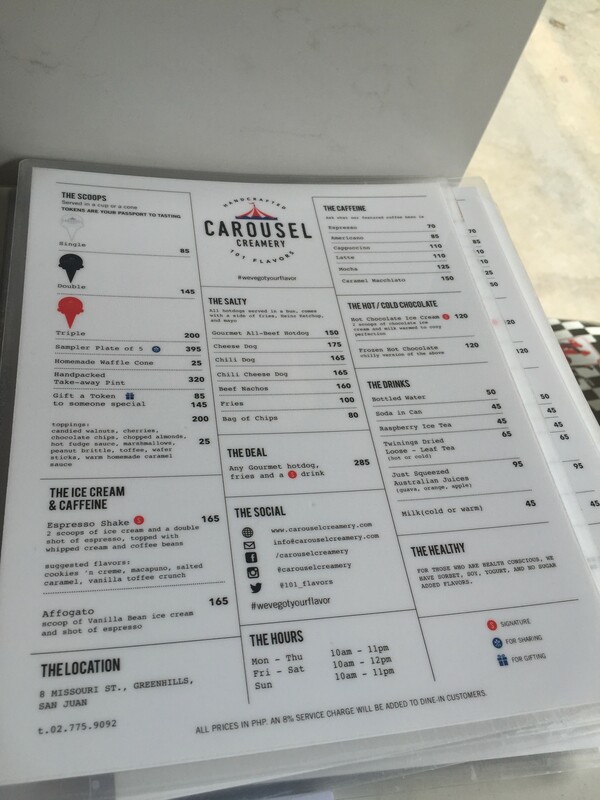 For diabetics, there’s always Cheese Dogs and Chili Cheese Dogs that you can grab at Carousel Creamery. Carousel Creamery joins The Dessert Kitchen, Farmacy and Baskin and Robbins to the growing number of ice cream parlors we have in the metro. Carousel Creamery only needs to learn from the mistakes of the Gelatissimo chain, which recently closed in major malls, and sustain its circus hype beyond the El Niño sun.